How do I start with an Online Example? 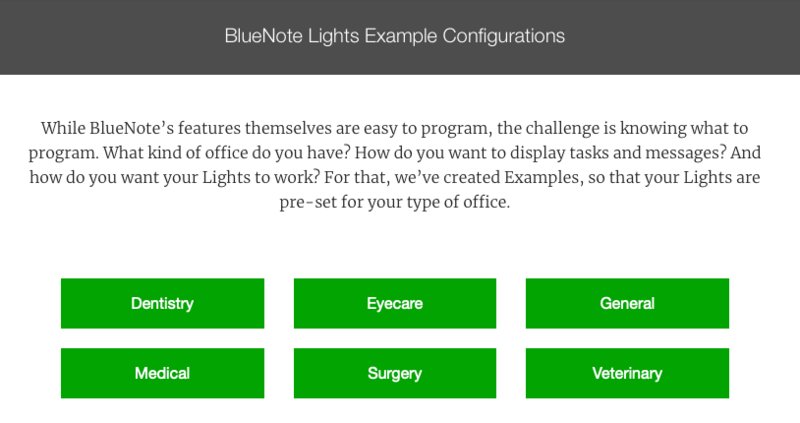 An Online Example is a pre-programmed set of Lights that is organized in a way that may be better suited to a particular type of practice, such as a dermatology office, an optometry practice, oral surgery clinic, or dental office. 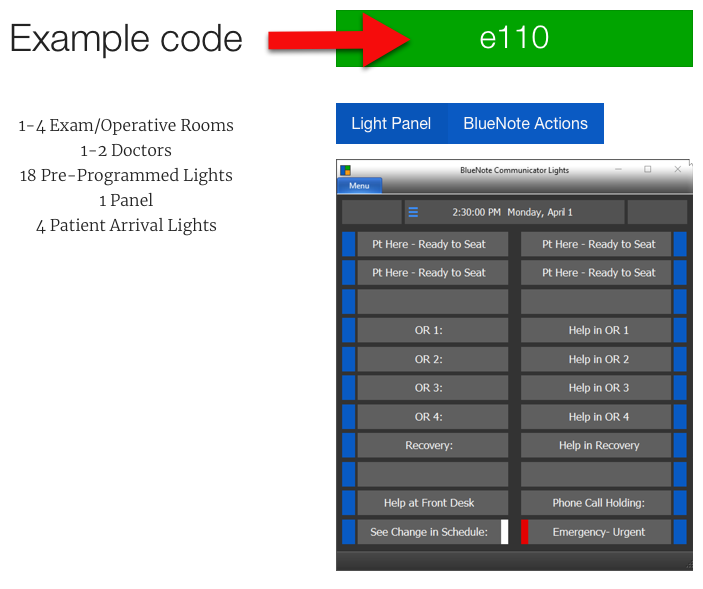 All you'll need is the 4-digit Example Code to use this as a starting place when building out your Lights configuration. 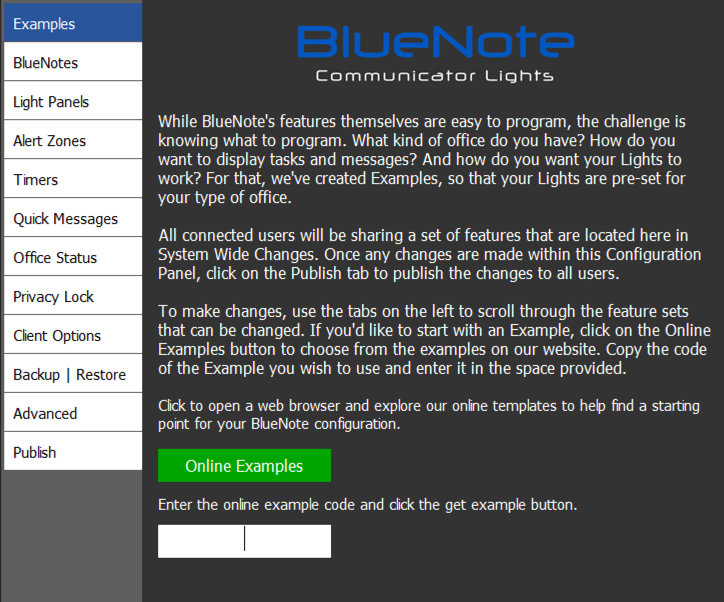 To use an Online Example, you'll first need to access System Wide Changes from one BlueNote client. Choose Menu > Preferences > Options > Advanced. Then click the "System Wide Changes" button and type in the word 'configure'. When you're ready, click on Online Examples. This will bring up a browser window with your choices. Select the one that best suits your type of office. We clicked the Surgery button. You can look at all of the choices within Surgery by scrolling through the Examples and seeing which one will best fit your office. Make a note of the Example Code that corresponds with the Example you decide to use. The last step is then to type in the Example Code in the space provided and then to click "get example". Once the Example is downloaded, you'll be taken to the Light Panels tab. From here you'll be able to add extra Lights, change the words on any existing Light, re-order the Lights, or delete any Lights that you don't need. To learn more about all the ways to customize your Lights and the sub-menus inside of them, see the Related Articles below, especially System Wide Changes. 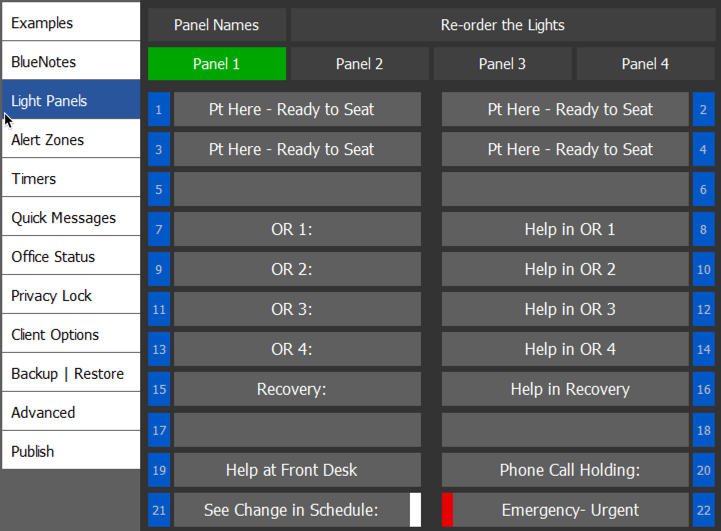 What suggestions do you have for programming the Light Panel? Can you show me all the ways a Light can be programmed to work?